You could say Schad was born with motorcycling in his blood. His grandfather had been a national racing champion, and Schad grew up lending a hand in the family parts and accessories business. To help sell some of their old inventory, Schad began listing it on eBay. Soon, he’d started running his own company, Speed Addicts, out of his freshman dorm room in Santa Barbara, CA. Today, Speed Addicts boasts multiple offices, retail space in Los Angeles, and nearly 100,000 positive customer reviews on eBay, Amazon, and SpeedAddict's website. Looking for a new lid? 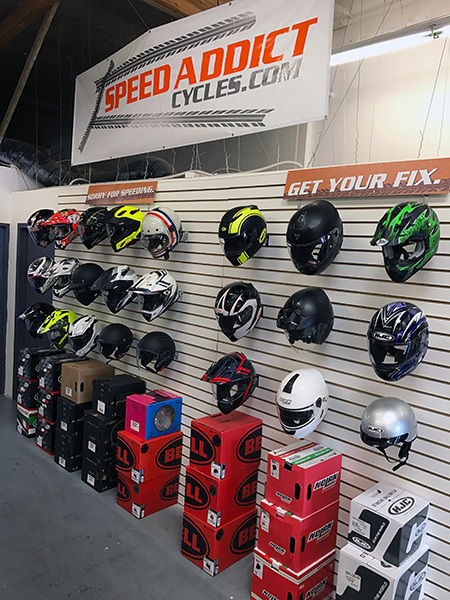 Come on by and get fitted in our new helmet showroom!